Glossary of Decorative Concrete Terms: What is a band? What is a field? Decorative concrete is a good option for homeowners that want a high-end look without the high-end price tag. Concrete is a versatile material that can be used for floors, countertops, patios, driveways and more. Techniques such as stamping, staining and polishing, can transform concrete to look like flagstone, marble or other expensive materials at a fraction of the cost. When compared with the cost of other materials decorative concrete is a mid-range option. 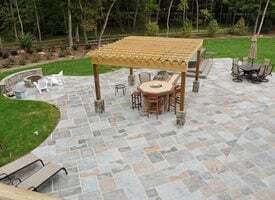 Outdoors, asphalt, plain concrete and gravel are more affordable, while natural stone and pavers are more expensive. Indoors, laminates and ceramic tiles will cost less, while granite, marble and hardwood will cost more. Decorative concrete is great if you can afford to spend some extra money but don’t want to break the bank. When determining the cost of a decorative concrete project, materials and labor are two main factors. The typical materials used are concrete mix, forming supplies, texturing and coloring products, sealers, etc. Labor will vary depending on your project - its size, whether you have new or existing concrete, how detailed the decorative work will be and more. Get bids from multiple contractors to make sure you are getting a fair deal.